The originals were typed up on a selectric in '82, then photocopied, then re-typed in a Performa 405, then switched over, and now cleaned up on an Ubuntu netbook. I got the idea during a pickup game in 1982 where I was DMing for some friends. When we could get together I would run modules and such for them, all in Greyhawk. I had just read a Dragon article about weather in the campaign and decided to see how it worked. The adventure was ostensibly a scouting mission through the Vesve to spy on Iuz's border forts. Instead it turned into a survival scenario as an unseasonable blizzard swept the area. The players loved it, I loved it, and I decided to make a set of charts of my Seaward campaign. Note: The formatting is a little wonky because of Blogger, so please excuse the appearance. 'Record High' or 'Record Low' means that the temperatures will be the maximum possible (i.e., if the base temp is 40, avg. high is d10 and avg. low is d20 a 'Record Low' means the high will be 41 and the low will be 20). A 'Severe Record' means use the maximums and add 1d6. An 'Extreme Record' means double the maximums. Unusual temperatures will last 1-6 days (roll d8-2 with a minimum of 1). note: sunrise and sunset times are for mid month. Terrain and weather can affect when PCs see the sun, obviously. On both charts add +1 from Frostflowers through Brightsun. Third (precipitation) – Determine the Type of Precipitation: Consult the following chart to determine the type of precipitation. The precipiration will begin based upon the cloud cover: clear = late afternoon/evening; partly cloudy = around Noon; cloudy = early morning. If the result of 'special' is rolled see the separate chart. than A.C. 5 who do not have shelter. Rings, bracers, etc. do not count, magic armor does. if the party is under a tree, on a hill in metal armor, etc. Damage is 6d6, save for half. If precipitation continues, worsens, etc. the temperatures will change as needed to min/max levels. Earlier this week I ranted about 5e from the viewpoint of 'I in particular and the RPG hobby in general don't have to have 5e to survive, be creative, or attract new people'. I only wrote it because I was getting direct messages from friends, acquaintances, and strangers that without 5e RPGs are dead, games will stagnate, the hobby will shrink, etc. When I wrote that rant I received some negative feedback from 5e boosters ranging from 'you are hurting the industry, man' to outrage and accusations of dishonesty for mentioning the list price for the game, to a threat to physically assault me for 'smearing 5e'. Ah, the internet. But since I wrote it I have also been getting direct messages from friends, acquaintances, and strangers along the lines of 'thank goodness you stand with the side of Light against the horrible, evil 5e that will destroy all that is good and great about our hobby'. So let me revisit this. If you think 5e is the End of the RPG Hobby As We Know It and it is more evil than Michael Bay I have news for you - 5e is a good thing, and nothing in the entertainment world is more evil than Michael Bay. "In your other article you trashed 5e"
Actually, I didn't. I pointed out that people who state I must support it and I must use it are wrong.And I stand by that - if 5e never existed the RPG hobby would be fine, and creative, and bring in new people. I will download and examine the free PDF - but I have copies of Labyrinth Lord, Swords & Wizardry, Four-Color, Blueholme, Spellcraft and Swordplay, Renegade, Myth and Magic, etc., etc., etc. Just like I have copies of Bushido, Timelords, Aftermath!, TFOS, and a dozen other games - I am an RPGer, I pick them up. But I have no plans to run 5e and - wait for it - I don't need it. But that doesn't mean it is bad. The fact that 5e is being released will bring in new blood. No, not because 5e is magic, but because boosters ranging from FLGS owners to the guy who wants to punch me will get out there and run demos, talk to people, email them, blog about it, etc. As i said in my earlier rant, bringing in new players is about people, not systems. But 5e will get some people who don't evangelize our hobby to recruit for the cause for the very first time. I want us all to think about how much we recruit new players without it being prompted by outside forces. Seriously - how often do you invite new people to play, host demos, etc? If you really are an OSR booster you do those things, right? 5e isn't going to harm the OSR one little bit. It might not help, but it won't hurt. The OSR is, by definition, about surviving and maintaining creativity. While a particular OSR game might flourish or fail the fact is the sorts of games that created the RPG community are here to stay. For both sides of the equation, let me put it another way - in 40 more years will 5e be 'old school'? Does Swords & Wizardry 'hurt' OSRIC or 1e? Does Blueholme 'help' Labyrinth Lord? If someone who plays 2e doesn't pick up, and play, and champion, Lamentations of the Flame Princess is he 'hurting the hobby' or in danger of 'stagnation'? If someone who plays 2e picks up and likes Blood and Treasure has he 'betrayed' anything and does the change 'hurt' the OSR? No, of course not. None of that makes any sense. So why would 5e be any different? 5e is just one more RPG among many, nothing more or less. The fact that it is new only means that there is a marketing push. In 4 months to 5 years some other new RPG will come out and kick up the same brouhaha all over again. Trust me, I've seen this happen often before. I know people still very, very bitter over MegaTraveller. Or Traveller, the New Era. Or T4. Or all three. Guess what? The LBBs weren't erased when T4 was published. And people weren't magically more creative because T4 was published, either. Same here. 5e will not make you give up OSR and it won't inject you with 'build a better campaign' medicine, either. For those of you who don't know, my fourth son, 11 years old, is creator of many great magic items. He made the Figurine of Wondrous Power - Hematite Badgers and the Wounderous Fruit Basket [that isn't a misspelling]. Here is his newest item, the Eye of Dreadful command. Everything below is as he wrote it to me, word for word. This a small(roughly 3" in diameter.) crystal sphere, in the middle is a small blot of black and green, appearing to all who observe it as a large green eye, it has a standard value of about 1,000 g.p. When grasped by a magic-user or cleric of 5th level or higher and a non-good alignment, however, it's true powers are revealed. Command(1 charge) -3 to saving throw. The subjugation affect causes the target to save versus death magic or be subjugated. The affect of this is that at any time you are showing the eye to the subjugated target, you may cast a command spell with up to 5 words(no save.). The target gets a new saving throw after 1d4 weeks, with a special +1 bonus per saving throw he was allowed in the past. The eye is built with 40 charges. When the eye either runs out of charges or is destroyed by any means, the creature possessing the eye loses 1 level(no save. )and all creatures affect by the powers of the eye will instead be dominated(save permitted) with a lasting command to kill whoever held the eye when it was destroyed. Whenever a good creature touches the eye, they lose a point of constitution which is regained when the eye leaves their possession. My oldest son was considering how clerics Turn or Rebuke Undead recently. We discussed the possibility of 'Turn Wars' where good and evil clerics use Turn Undead (or Rebuke Undead for the evil cleric) in a sort of proxy war with zombies shuffling back and forth as the good cleric Turns them and then the evil cleric cancels the Turning by Rebuking them over and over until one or the other misses his die roll. "Clerics should be able to rebuke paladins." That certainly makes sense - evil clerics can, after all, Turn paladins. Heck, I would argue evil clerics can Turn things like coatl, lammasu, and other Good beings with ties to either the Positive Material or Upper Outer Planes. So if an evil cleric Turns a paladin it makes sense that a good cleric could then cancel that by Rebuking the paladin. "So why couldn't a good cleric Rebuke a paladin to prevent him from committing an evil act? Or a Lawful Good cleric do the same to prevent him from performing a chaotic act?" Hmmmm. Sure, why not?After all, the chaotic or evil act must come from some wavering of faith or, worse (and more likely) a Charm of some sort. So after a bit of discussion we worked it out this way. 2) The cleric must be Good to Rebuke a paladin from committing an evil act or to negate the Turn of an evil cleric. If the cleric isn't Lawful Good this is at -1. 3) The cleric must be Lawful Good to Rebuke a paladin from committing a chaotic act. 4) If the paladin is acting chaotically or evil because of a Charm or similar magic a successful Rebuke gives the paladin an immediate save with a bonus equivalent to the difference between the number needed to turn and the number rolled. Example #1: Sir Roland (a 5th level paladin) and Brother Eirik (a 7th level cleric, LG) are part of an adventuring party clearing out a defiled catacomb. Suddenly an evil cult leader (7th level cleric, CE) appears on a ledge and Turns Sir Roland, rolling a 17 - Sir Roland is compelled to turn and flee. Brother Eirik, however, calls upon God and Rebukes Sir Roland, rolling a 19 - the Paladin turn back to face the cultist filled with holy resolve. The cultist tries again but rolls a 3 and failes. Sir Roland moves to kill the miscreant. Example #2: Sir Roland and Brother Eirik are returning to their home abbey from the catacombs when a lovely dryad approaches. He mystic powers envelope Sir Roland (who rolls a 3 on his saving throw) - his sword drops from numbed fingers as he prepares to abandon his services, forget his oaths, and leave with the tree spirit. Brother Eirik clutches his crucifix and calls out to Sir Roland, Rebuking him. Brother Eirik rolls a 19, 3 above the required 16. Sir Roland rolls again, adding +3 because of the successful Rebuke, and gets a total of 22. No longer Charmed he retrieves his sword and continues to the abbey. Example #3: Telemar the Paladin (2nd level) is serving as a guard at the Cathedral when the powerful evil mage Alyndera attempts to steal the evil Staff of Black Magic from its vaults. Alyndera casts Charm Person on Telemar, who rolls a 9. Using a Forget spell and her high Charisma Alyndera convinces Telemar to open the vault for her. As Alyndera prepares to remove the wards protecting the staff Archbishop Gregory (16th level cleric enters the vaults, alerted by a Glyph. "Telemar, that is the demon disguised as the archbishop I told you about! You have but a moment before he kills us all!" Telemar draws his sword and strides toward the Archbishop. Gregory, knowing time is of the essence, utters a prayer and Rebukes Telemar, rolling a 12; since Gregory has a T result to Rebuke Telemar the young paladin gets a new save at +12. Telemar faces Alyndera with a stern look as the Archbishop joins him. Will this come up often? No, but it is an interesting element to add depth to your campaign. As you are warned in my slug line, this blog is occasionally rants. DnD 5e is coming, as we all know, and while I do not agree with some of its foes that it is the Devil, I also reject its evangelists who tell me that if I don't support 5e I am a Terrible, No Good, Very Bad gamer. To the former I say - settle down, Francis. I am only extending my reply to the latter because I keep seeing on forums, feeds, and such that I must support 5e; that the hobby needs new blood; that without change we will grow stale and moribund; that only shiny and new can attract new players; that OSR and its proponents must evolve; etc. Classic Traveller, 1e, 2e, 3e, 4e, Hero 5th, Hero 6th, Rolemaster FRPG, Hackmaster 4th, Hackmaster Advanced (well, I am waiting on a shipment), Castles and Crusades, and more. I have partial sets (enough to play, easily) of many more RPGs. I also have only 2-3 modules to go to have a complete set of Starfleet Battles, my gateway drug. I also have a TON of board games (including a copy of Britannia given to me by Lew Pulsipher, thank you very much), and card games, and computer games, and my own stuff. I don't need anything to play. "The hobby needs new blood". Yes, it does. A new version isn't how that happens. Yes, my sons play and that is, kinda' a cheat. But I am also dragging new kids in all the time. I am having a bunch of late teen kids over to teach gaming to; they are eager. I am teaching them 1e, baby. I have a PDF ('An Intro to Dungeons and Dragons' that I wrote) and a PDF intro to my campaign that I send to people interested in playing. I will sit them down with pencil, paper, a lemonade, and a 1e PHB and in 15 minutes per kid have working characters they understand. With my sons helping we can get 4 newbies playing in 15 minutes, total. I've been teaching people to play RPGs a looooong time. I don't need a shiny new version that costs $150 for three books to do it for another 40 years. Bringing in new RPGers is about people, not systems. "Without a new version the hobby will get stale and moribund". First, speak for yourself. Second, in my experience the most stale the industry ever was happened right after the first d20 die off. You remember that, right? The OGL came out, hundreds of guys started cranking out d20 books, then a year or so later 99% of them crashed a burned? Well, after that WotC was cranking out splatbooks left, right, and center. There was a new book coming out All. The. Time. And it was stale, stale, stale. All those new ideas, new rules, new mechanics really stifled creativity, didn't they? And it wasn't just the paradox of choice or analysis paralysis, it really was a stifling of creativity in 'the field' by the release of rules from 'the office'. Why were people spending energy on arguing about stat block format? Because any minute a book could come out that destroys your innovation. So you had to either ride the wave (and be less creative) or isolate yourself from the new books coming out. Contrariwise, look at the OSR. The sheer volume of writing, much of it very good, being cranked out over systems that have been out of print for decades is, you must admit, amazing. How can anyone look at the explosion of creativity flowing out of 0e, 1e, and 2e and claim 'the hobby/industry' needs a new version to avoid stagnation and keep a straight face? "OSR players must evolve". First: must we? Like I just said, there is a lot of creativity flowing out of 1e and such right now - why would I need to evolve away from a system that is still so creative and productive 35 years later? My 1e campaign is 36 years old and I am still adding details and depth. If it gets moribund I will start a new one that is still 1e! Second; even if we must, does that demand we adopt a new edition? I mean, I have 50+ pages of house rules, don't I? Looks like I have evolved just fine without a new edition. Look, I don't fight edition wars. I run a 1e campaign and a 2e S&P campaign. I have an active Champions game. I will play 3e or run it. I don't like the 'feel' and flow of 4e, but that is just me. 5e? I don't care. And that may be the most damning thing I can say about any game. Note: As I was about to publish this I found this very similar piece. Casting time - 5 seg. When cast this spell creates a volume of coffee to fill a single container. The container can be as small as a demitasse or as large as a quart jug. The coffee will be hot (temperature will vary according to the caster's wishes, but will always be above room temperature) and as strong as the caster prefers. Very hot coffee may cause 1-2 h.p. of non-lethal damage to a drinker. If a quart container of very hot coffee is poured over or thrown onto a creature (range 5') it will do 1d4 damage. The material components are a single coffee bean and a drop of water. During casting the container to hold the coffee must be held in the caster's off hand with the components inside while he makes a tilting gesture over the mouth of the container with his primary hand and mutters darkly under his breath. Ah, the topic of spell components. Often a source of humor (swallowing a live goldfish?) and sometimes meant to provide balance (and to vacuum out every copper the mage has, How much diamond dust does a mage need? All of it!) they are sometimes given a miss. When I first began to DM I made spell components mandatory - they casters of all stripes absolutely, positively had to have the listed components in order to cast spells. The end. You don't have a live spider? You can't cast Spider Climb. This often led to drama and drove character actions - PC's mentioning that they carry small vials with corks that have tiny holes and that they catch little garden spiders while scouting, for example. In one memorable adventure one of the party's magic-users was frantically crushing some diamonds just found in a treasure chest hoping it was enough for him to cast a Stone Skin spell that might get him out alive. But in some games (one shots, short arcs, etc.) it was frankly too much trouble. Unless the component cost more than about 50 g.p. we just gave it a handwave. And I know I am not alone - most games that I have played in just ignore components. In my new-ish 2e S&P campaign when I was using spell points I had a simple rule - 50 g.p. per level of the caster per adventure to cover the cost of components. So the 7th level Fire Elementalist would make off 350 g.p. just before the adventure and we assumed this covered the cost of any components he might need. Simple, didn't require a lot of paperwork, and still removes cash from pouches. I can't remember where, but I once saw material components as 'being prepared taxes' and I think that is actually appropriate. I am also careful to track arrows, sling bullets, etc. and have general maintenance charges for all characters, too. But Seaward, my 1e campaign, still requires careful track of components. Each city and large town has one or more magic shops (these sell components, parchment, ink, etc., never magic items) and magic shops exist in a few smaller towns. In some villages and even a few remote areas there are hedge wizards (an NPC-only spellcasting class) that either actively collect and sell components or can be convinced to sell. When a spellcaster is not collecting components by gathering them directly they usually go to one of these sources. When they do I have a chart I refer to to determine if they have the component and how much it costs. It sounds like a lot of work, but the chart was a one-time thing and the depth it adds is a lot of fun. Yes, I am a big fan of Figurines of Wondrous Power. And why not? They are nicely odd, wonderfully non-scientific, and useful. The llama has no melee attack but the owner may command it to spit once every other round with a range of 60'. This spit is targeted as a creature of 5 HD, has no range modifier, and any creature struck must save vs. wand at -2 or be blinded for 1 full round. The full sized llama comes equipped with a woven harness and wicker baskets that may hold up to 600 lbs of weight. The llama maintains its full movement rate when carrying 300 lbs or less and is at half movement rate when carrying between 301 and 600 lbs. If more than 600 lbs is placed on the llama it immediately reverts to figurine form and cannot be activated again for 5 days. The llama is extremely sure-footed and has no trouble navigating stairs, ledges, narrow bridges, steep, rocky slopes, etc. If carrying 300 lbs or less the llama is easily as agile as a mountain goat. The llama is also a strong swimmer and has no fear of monsters, fire, smoke, spell effects, etc. The llama will never enter an extra-dimensional space while activated. The llama may never be used as a steed for a living, conscious creature. 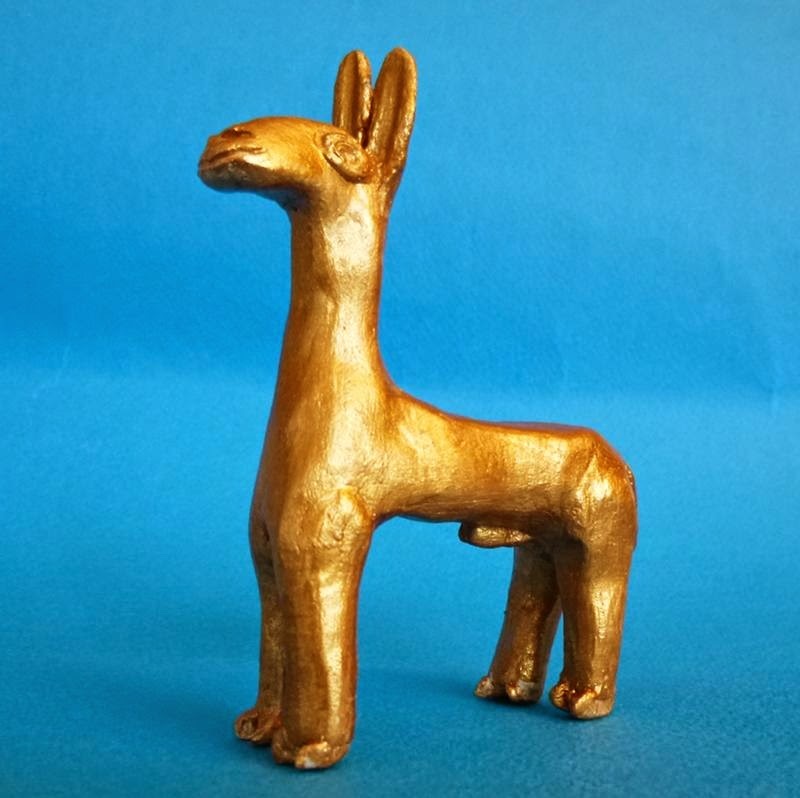 Unconscious creatures, dead bodies, caged birds, even pets may be carried, but a conscious, living creature capable will simply be unable to mount the llama. This includes bound prisoners. The figurine can be activated for up to 16 hours at a time for no more than 80 hours per months (from new moon until new moon). Or, more simply, either 5 full days of 'dungeon crawling' and it is deactivated while the party sleeps or 10 full days of cross-country travel and it is deactivated while camped. If 'killed' by damage it reverts to figurine form and cannot be activated for 72 hours. Another first for Don't Split the Party - a product review! Before we get too deep into the product itself, let's talk about gaming ambiance. We all know that the setting for play can matter as much as or more than the setting in the game. If you have a group of investigators creeping into a dank, cobwebbed cavern at night hoping they can stop Nyarlathotep playing on a beach with laughing bathers nearby is not going to enhance the mood. Playing a silver-age, four-color superhero campaign in a steam tunnel will not enhance the mood. GMing for players standing on a windswept, rain-soaked mountain peak as they gaze down at the orcish hordes marching to crush the last dwarven city is not the time to be playing j-pop. Not that there is anything wrong with j-pop. Back in 1982 I had already been running Seaward (my 1e campaign) for about 5 years. I had handouts (thanks, mimeograph machines! ), a few props, and things like a wall hanger sword for when we played. But one night while I was DMing I left the Conan the Barbarian soundtrack running. The players loved it, especially Mary and Shelby. Pretty soon I had 5 mix tapes (ah, cassettes) for gaming; forest, underground, sea, desert, and battle. I would play them during sessions and players would sometimes donate new music. This is pretty common, I know, and more people seemed to do it when CDs and (eventually) digital music came along. But I always was searching for more and more. I was an early adopter of soundboard programs and when game-centric soundboards hit I started trying them all, including for my phones.I also mined audiosparx, soundrangers, and other such sites from the dim, dark past to get the sounds and ambiance I wanted. There were a lot of OK solutions and a few good ones, but I always ended up back in a mixer program fixing something. Why? Because I am a hard to please jerk that way, that's why. I downloaded Syrinscape last week and went ahead and tried it and some bonus packs. First thing I love is that that is runs on Windows, Mac, iOS and Android. With just a touch of work I got it working on an Ubuntu netbook. The sounds are crisp, professional, and varied. I can adjust the various sounds either with presets, make my own, or on the fly. It was easy to use, has a ton of add on content (I highly recommend the SoundSet Starter Pack; it was a big hit at the table) and it looks like more is coming, too. On the technical side, it was not a resource hog either in memory or RAM usage, I didn't have to fiddle with my sound controls a lot to make it audible, and I never experienced any skip or lag, not even with my wimpy little netbook. My only complaint is - I could not find a tool that would keep my screen from going to sleep while it was running. Yeah, I know, that may not be a quibble to many but a) sessions run long and if the screen is open I don't have to pause so much to keep going and b) I am a hard to please jerk, remember? Of course, I have been running it on Ubuntu so this may not be an issue on a fully supported OS and I could always take the 30 seconds to change my screen settings. Huh. Looks like I am a hard to please lazy jerk. 9 out of 10 stars, highly recommended for any game master. I suspect I won't be able to live without it. If you have read my first two entries on my 2e campaign, found here and here, you might understand the next bit better than most. The players were approached by Master Merchant Ewin Silverhand with a proposal - retrieve an idol and be well paid. The players sailed to his outpost to learn more. The Fever Lands are the name for the central portion of the vast Southern Continent. A massive jungle that stretches far to the south from the equatorial coast it is bisected by a huge swamp. While rich in rare woods, spices, gems, ivory, and precious metals few venture into its interior because of the savage tribes, terrible monsters, and the ever-present parasites and fevers. Instead brave souls built heavily fortified outposts along the coast and attempt to trade with the local tribes. Ewin is the founder of one such outpost, built on the mouth of a river far east of the edges of the great swamp where 7 previous outposts had failed - 2 simply through lack of trade, 2 wiped out by plague, and three destroyed by attacks of the locals. Ewin had very carefully cultivated good relations with the natives and was becoming quite prosperous when trouble began about 2 years ago. Rumors drifted from the interior that some foul demon lord of the locals had returned; Xipe, lord of flayed skins. Since then there has been less and less trade and the friendly local tribes are under more and more pressure from the interior tribes to obey the terrible torture lord. Ewin talked with each of the friendly shamans and learned that only if he held the idol of Tlaloc could he prevent the spread of the cult of Xipe. Ewin called upon he cousin, a Bishop, who divined that the lost idol of Tlatloc was hidden somewhere in an abandoned temple days upriver from his outpost. Ewin's own people either returned from the trip exhausted and lost or simply never returned. Desperate, he sent a note to the party who had once helped a ship captain based in Ewin's outpost. The party arrived a month later, were told the broad strokes of the problem (but not about previous missions failing or vanishing) and set out on foot to follow the river upstream. After a few encounters with monkeys, jaguars, and such they ran into two groups of men in a fierce fight. Recognizing that the smaller group wore the face paint of a friendly tribe the party waded into the melee and killed the attackers. Then Marigold healed their injured, sealing their faith in the party. The 4 rescued tribesmen explained that the worshipers of Xipe were raiding for human sacrifices to their horrible demon master and preparing to conquer all the lands between the ancient ruins and the coast, driving out the traders.After a bit of negotiations the tribesmen agreed to guide the party to a place close to the city. Soon the party was in two dugout canoes traveling upstream. With the expert advice of their new guides the 4 days going upriver went relatively smoothly. Before the tribesmen left them 1/2 day's river journey from the city they warned them that: A) the jungle around the city for several days to the North was full of Xipe cultists who would gladly kill them; B), in this region the north and west banks of the river (it was in a mighty bend) belong to Xipe tribesmen but never, ever cross to the south or east banks because that was where the cannibal dwarves lived and they were much worse than the Xipe cultists; C) they had to finish and leave before the new moon in 6 days because on the new moon the winged apes searched for a sacrifice to their dark god; and D) stay away from the jade tower because it was maybe worse than the cultists, the dwarves, and the winged apes. The party found the city around 10 am the next morning in a bend of the river where it changed from flowing east to flowing north. The stone quay had been recently repaired and there was no large animal alive in the city. They ascended the mighty temple and began searching for a way in. While looking they realized they could see the Jade Tower a few miles away, south of the river. Before too long Steve and Neun had found a secret door that appeared to have not been used for centuries. They also, through very careful examination, determined it required blood from a living creature to actually open the door. Steve pulled goat from his Bag of Beans, used it to activate the door, and the party entered the shrine. Drake was not super-happy with the goat sacrifice, but they soldiered on. They found a secret room containing a statue holding a scepter. The statue had the face of Tellon! The party decided to disturb nothing and continue with their exploration. The party passed through a room with a mummified centaur which attacked them as they left; it lightly wounded Drake but Drake and Neun made quick work of it. Soon they found a room with a type of fountain in it; as they entered a Water Weird began to form but Marigold (who made her obscure knowledge and arcane lore checks quite handily!) immediately cast Purify Water and defeated it before it could even attack. They noted that one of the faces carved in the wall looked just like Tellon. After a lot of searching they eventually found a secret door to a hidden tunnel. This tunnel led to the top of a a 'hill' in a room that resembled a little 'country'. The party stuck to the defined path and left the room safely. As they left they noted that one of the many small figurines on the room was identical to Tellon. Outside the room they did their habitual 'go to the left' and quickly found stairs further down, which they took. As they descended the stairs a dragon statues emerged from a hidden room and blasted the entire party with steam, injuring everyone, then the statue returned to its hidey hole. Marigold and Kugel used the last of their healing magic to heal the party to full. Looking around and finding they were in an empty corridor they party set up a watch and slept the night at the base of the sitars. Session 2 began with the party taking stock of their light sources. They were very low on torches, but Marigold's shield could emit Light at will. Then there was a long discussion on whether Marigold should take Speak with Animals or not - she habitually memorizes it but was unsure since animals should be rare in the pyramid. Eventually she took it 'just in case'. At the end of the hall they entered a large room with high ceilings and a rubble-strewn floor. As they entered they noticed mandrills staring down at them; the mandrills immediately began shrieking and throwing feces and rocks. Marigold cast Speak with Animals and learned the mandrills feared and hated humans because they had started to come to the city and hunt the mandrills for food. Marigold explained the party was there to stop the 'bad eaty men' and the mandrills, who believed her, brought the party a load of fresh fruit and even some branches to be made into torches (the party had oil and rags). The party then started searching the room when - two giant snakes attack from a pile of rubble! Both attack Neun who is surprised (so far Neun has been surprised in every single encounter in this adventure). Both heads hit for a total of 5 points of damage. Neun rolls his saving throws; a 17 and an 6. Neun falls dead from poison. Tellon and Drake were already running up and kill the foul two-headed serpent in a single round. Marigold casts Slow Poison, reviving Neun, and then uses her magical herbalism kit and magical healing kit, makes her skill checks, and neutralizes the poison. This led to a discussion of the rather interesting ex post facto nature of the Slow Poison spell. Technically, for many poisons (especially in 1e) the moment you fail a save BAM!, you're dead. But Slow Poison states that it slows the effects of the poison so it hasn't taken effect quite yet. In effect the game mechanics of Slow Poison mean that a dead character isn't 'brought back to life' - instead, they were never dead to begin with. Very fun and could lead to some interesting twists. Oh, and their search only revealed another carved face that looked just like Tellon. The party then found a room with broken pottery and an ash-covered floor where images of the dead would form from the ashes. They carefully walked around the edges of the room to avoid disrespect and went on. Beyond was a large room full of stuffed cats, a wall carved to look like a jaguar's face, and a stone statue of a cat-headed man. There was also an altar. Side note: in my campaigns religion matters. A lot. Failure to do the right sort of things = no cleric spells. Failure to follow tenets of your religion = Cures don't work anymore. Thus, religion drives a lot of actions. The party puts Tellon and Drake watching the statues, Neun and Steve watching the rest as Marigold and Kugel take holy water and make sure the pagan altar is no longer consecrated to the evil gods. As this happens the statue of a man transforms into flesh and blood - and a jaguar!, and leaps for Steve. Tellon, who was ready, immediately struck at the leaping figure and did maximum damage (his dice were hot that night) causing the figure to fall to the ground, critically wounded, return to human shape and then revert to statue form. The party learned the statue (of basalt) was too hard for them to shatter with the tools they had, so they left Tellon watching it while they searched the room. The party discovered a secret door and followed it into a room that was a model of the city in which the pyramid rests, looking as it did when new. There was also a normal-sized coffin in the room. The party was standing on a columned area not part of the model and saw another, similar, area nearby. They decided to investigate but as Tellon passed the columns he was separated from the party by a wall of amber-colored flame. In a quick solo session Tellon fought and killed a doppelganger who desired to replace him. It was a rather quick fight with Tellon the clear winner but as he was finishing off the doppleganger. So the party just saw one Tellon kill another Tellon while claiming he was the real one and the other was a duplicate. It took some time, but the party was soon confident that their friend was, yes, their friend. They learned the other area was a foul altar used for human sacrifice and consecrated it (ruining it for evil) and [for once!] looted the room. About this time Marigold noticed that the air in the deeper pyramid areas was old and a bit foul. She concluded that too much time in the deep levels could eventually weaken and kill a person. They returned to the jaguar room and saw that the cat-headed statues was once again upright, not laying down. The party carefully entered the next door clockwise. Beyond a short corridor they found a weird two-part room. In one end was a well and a wide air shaft that obviously eventually led outside. At the other was a horrible statue of some foul demon surrounded by hot, glowing coals. The walls in between were hung with relatively fresh, still-bloody human skins. The party didn't fully enter the area, but only scanned it and decided it wasn't part of their mission. As they left they heard a deep, booming, mocking laugh echo from behind the now-shut door. Returning to the jaguar room once more they noted the cat-headed statue was now looking at the door they had just used. The went on to the next clockwise door. Noting the passage of time and realizing they were in another relatively secure corridor they spiked the doors and began a watch cycle. end of the second session. NOTE: PLAYERS IN MY CAMPAIGN SHOULD SKIP THE NEXT SECTION. I love the old classic Hidden Shrine of Tamoachan and always intended to have it in this campaign world. But since it has to fit into the world and 2e I modified some of the contents to reflect the backstory of my campaign. The background of the city and shrine are now that this was a stronghold of the necromancer cultists who obey She Who Waits and that Tamoachan was the center of the uprising that threw down the Jade Empire and led to the first of the seals that imprison She Who Waits to be broken. After the great civil war that ended the Jade Empire Tamoachan was abandoned due to both the great loss of life of that war and the departure of the Necromancer Priests that had built and ruled it. The Shrine itself, however, remained a lethal pit full of traps and worse. It was discovered by the archmage Malakar over 8 centuries before the time of the campaign and he learned a great deal from the inscribed jade plates he found within (and took with him). Another member of his mage house later backtracked its location from Malakar's journal and perished attempting to penetrate its lower levels. Eventually during the interregnum between the Ruby Empire and the Emerald Empire a powerful mage re-discovered the shrine, learned that its lower room was protected against all forms of divination, and hid a pagan idol that he had enchanted with a powerful effect there, in the innermost room of an abandoned and forgotten temple so that it might never be found. This idol is the one mentioned below. After many centuries a group of evil mages and foul clerics fled into the jungle, seeking a refuge. While at first they attempted to settle in the city of Tamoachan itself this proved far too dangerous. An ogre mage had moved into the temple and assumed the appearance and such of the demon-lord of torture and slaughter [the section of the module with an airshaft to the outside and hot coals] and had incited the worship of two groups - the degraded shamans of the southern tribes as well as a local tribe of tobelit, the fearsome winged carnivorous apes of the Fever Lands! The ogre mage is using the shamans to stir up the southern tribes into an all out war on the trading outposts along the coast. He hopes to call more of his people from the East to then rule a kingdom in the jungle as gods. The cabal of evil used the reanimated bodies of the dead city dwellers to build a citadel on the south bank of the river on which Tamoachan sits. This mighty building, made of a greenish stone, is now called the Jade Tower and although 2 miles away allows the inhabitants to watch the city and the shrine. Since it was completed no one has been seen to enter or leave. I modified essentially every encounter to be a little tougher, removed some traps, made the remaining traps deadlier, added some magic items and spells, and reduced the treasure. I also greatly reduced the effects of the poison because my time limit is imposed from outside the shrine itself. The original goal of the Shrine was to delay and distract the party so that the poisons killed them. For that end there are a lot of interesting rooms, puzzles, etc. as well as just old-fashioned confusing layouts, secret doors, etc. to slow them down. I am fascinated by how the party is staying tightly focused on their goal (finding the deepest room and retrieving the idol) so that they have completely bypassed several areas of the map!. Indeed, their focus led them to ignore Xipe, a decision that could come back to haunt them. A first ever for Don't Split the Party, a movie review! Godzilla is big in our family; I saw Godzilla vs. the Smog Monster in the theater as a child; the first movie in a theater I took my oldest son to was Godzilla 2000; the first movie my second son bought with birthday money was a Godzilla combo pack; my second son learned enough Japanese Kanji to read 'Gojira' when he was 4 - on his own. We all collectively hate the 1998 American Godzilla. A lot. So when a new American-produced Godzilla was announced we were concerned. But the buzz was good, the press was positive, and Japanese critics were generally positive. So we saw it at a Friday afternoon matinee with the entire clan (minus son number 5 - too young). The Good: The overall acting was very good. Juliette Binoche and Bryan Cranston are great as the married nuclear engineers who start the plot rolling in their own ways. David Strathairn is as good as ever doing a great job as the senior military man dealing with the events of the film. Ken Watanabe is powerfully understated as the lead scientist and Sally Hawkins was surprisingly good in a relatively small role as part of the scientific team. In short the experienced, veteran character actors were awesome. The action protagonist, Aaron Taylor-Johnson, put in a solid journeyman actor performance. He avoided the danger of being overly emotional or too wooden in a very visible role. Elizabeth Olsen was likewise a solid young actor and the interactions between them were solid. The effects were very good and the designs were likewise good. The action scenes were dynamic and surprising, and the buildup of tension was very well done (it got 4 startled jumps from my wife!). The two twists were surprising without feeling ludicrous nor too obvious and the overall plot, character motivations, and dialog were as realistic as possible in a movie about giant radioactive monsters. The Bad: The opening was nicely atmospheric but seemed to lead into more slow buildup. The pacing of the first 1/4th of the film seemed just a touch slow, but not to the point of being disengaging. Some of the character interactions, especially between military types, were unrealistic. Sorry, but no non-commissioned officer is ever going to speak to any officer in the manner shown once or twice in this movie. Yes, I know, it is a movie, but it really snapped me out of the film when it happened. There were one or two similar sorts of things (some of the actions mothers took concerning their children seemed more plot-driven than realistic; the idea that evacuation routes would be that obviously dangerous seems unlikely) but they were secondary. Below this there are spoilers. Maybe a lot of them. The Good: The screenwriters, director, and producers took risks and they paid off. Juliette Binoche dies almost immediately? Bryan Cranston dies before the halfway point?! It isn't two kaiju but three?! Great stuff and it really added to the tension. The shout-outs to previous movies were amazing and fun, We caught references to Mothra, Ghidorah, Anguiras, King Seesar, Manda, and Titanosaurus - and we certainly missed some. I remember reading a ton of articles about how much urine kaiju create, how much they would need to eat, all that stuff. And the film makers promptly toss that all out and neatly explain how the kaiju are so big, why radiation doesn't hurt them, why they attack nuclear reactors; and all tied in to their origins! The idea that they are various animals from when the Earth was highly radioactive and thus consume radiation is a wonderful conceit and was like extra butter on my willing suspensions of disbelief's popcorn. The kaiju battles were will made, well paced, and gave a real sense of tension. The ending was solid and left a wide door for sequels and the setup allows for new monsters galore. One of the best things done well by this version, in my opinion, is the sense of scale. Big battles, huge devastation, gigantic creatures, big stakes. The shots of the effects of kaiju were stunning and emotional. The Bad: Although a bold move that really drove the movie Cranston was so darn good that I spent the rest of the film missing him after his death. A similar bold move - to not show more than a moment or two of the first two kaiju battles made sense to me (none of the primary characters were there to see them) and built some tension and even led to a surprise but I was there largely for the kaiju battles. I wanted to see more of them even if it meant a longer film, so we were all disappointed in this even if it did make sense and build some tension. And a minor quibble; I know it was meant to show how darn big he is, but after Godzilla effortlessly destroyed a number of ships would the navy have kept so many ships right next to him? Finalanalysis? Not a perfect film, but well worth seeing and a ton of fun for the entire family! Cranston deserves awards for his acting, BTW.